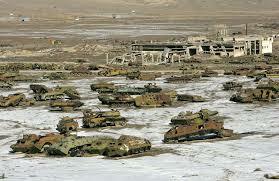 Soviet tank graveyard and derelict Red Army barracks east of Kabul, Afghanistan. That Chinese restaurant joke with the fortune cookie? The one where you read aloud the fortune and add "in bed" to the end? Donald Trump's foreign policy sounds like that joke, only ending with "in Russia." Trump also excused Russian intervention in Afghanistan, saying, "The reason Russia was in Afghanistan is because terrorists were going into Russia. They were right to be there." In Simi Valley, CA, President Ronald Reagan rolled over in his grave. Nobody was talking about this, Maddow observed. The concern existed nowhere except as part of a Russian "military intelligence disinformation campaign" to influence Belarus. Yet somehow it was an agenda item for the new Trump White House. Last summer in an interview with Fox News, Trump blurted out that the people of Montenegro (a new NATO ally) "are a very aggressive people." Trump adds, "They may get aggressive and, congratulations, you're in World War 3." What? Maddow pointed out that at his first NATO summit, Trump went out of his way to physically thrust aside the Montenegran prime minister. Perhaps it was simply Trump being a pompous boor. But where does a deeply incurious, under-informed man such as Trump glean obscure tidbits on foreign policy that parrot propaganda from Russian intelligence? Trump famously repeats what he has heard from the last person(s) who spoke with him. Who might that be?